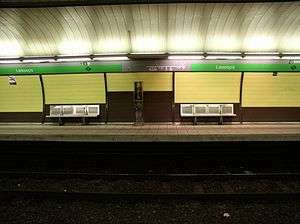 Public transport in Barcelona (Catalonia, Spain) is operated by several companies, most of which are part of the Autoritat del Transport Metropolità, a transport authority managing services in the Barcelonès and the rest of the metropolitan area of Barcelona. This article is a summary with transport facilities and services strictly within the municipality of Barcelona, and contains links to more specific articles. Barcelona was the first major city in Spain where trains were implemented. The first line in the country ran from Mataró to Barcelona. After permission was granted by the government, it was built between 1845 and 1848. 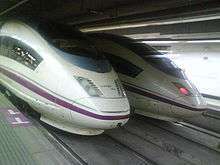 High-speed train services (AVE and Avant) were introduced by Renfe in 2008. 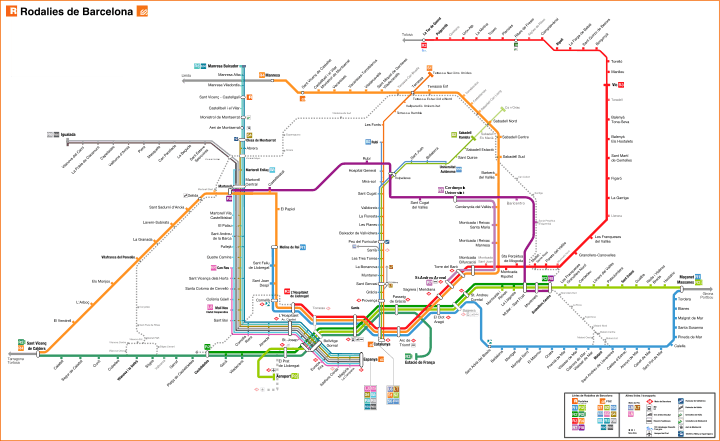 Map of Rodalies Barcelona and FGC lines. Currently railway lines in Barcelona are owned by Renfe and Ferrocarrils de la Generalitat de Catalunya (FGC). Rodalies Barcelona is a commuter railway network serving the metropolitan area. It's presently operated by Renfe and FGC even though the latter will operate all Rodalies lines from 2010 onwards, alongside its other commuter lines. Altogether they will make up 15 lines. Siemens Velaro designed for speeds of 310 km/h (194 mph) at Barcelona-Sants AVE station. ^ All Barcelona trains start in Estació de França or Barcelona Sants. ^ That line was traspassed to U.N. Rodalies and now is considered a Rodalies Barcelona line 3 enlargement. Two main railway stations of Barcelona: Barcelona Sants railway station and Barcelona Estació de França. There are currently 27 open railway stations in Barcelona (228 in the metropolitan area). The city's current main terminal station is Barcelona Sants. The construction of Estació de la Sagrera, presently taking place in La Sagrera and designed by Frank Gehry, will be a station of equal importance serving the other side of the city. Among other main stations, Estació de França has seen its importance reduced in the past years, and Estació del Nord (next to Arc de Triomf) is no longer a railway terminal but a coach station and athletic facility. El Clot-Aragó station was planned to be replaced by a new Glòries railway station at Plaça de les Glòries Catalanes which would be one of the main transport hubs in the city when completed, but Plaça de Catalunya railway station, in the centre of Barcelona (Plaça de Catalunya) is the only station in Barcelona where Renfe, FGC and Barcelona Metro lines join. 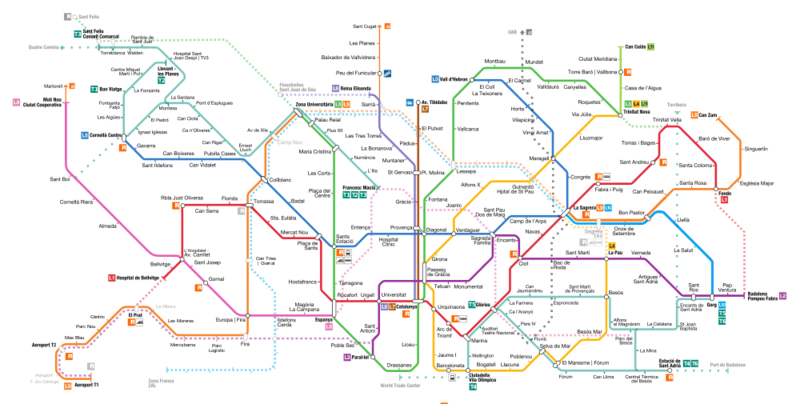 All FGC stations except for those between Peu del Funicular and Les Planes also offer Barcelona Metro services, although trains operate every 6 minutes on workdays and 10 on weekdays, which is a better service than the L11 schedule. The Barcelona Metro, an electrified railway network, has served the city since 1924, when the Gran Metro and Metro Transversal. The original project was devised in time for the 1929 Universal Exhibition which took place in the city. Nowadays it is operated by two different companies: the proper metro lines being part of the Transports Metropolitans de Barcelona (or TMB) network, and three metro services integrated in the commuter railway network of Ferrocarrils de la Generalitat de Catalunya (or FGC), Catalonia's public railway company. In addition to the eleven current working lines, the network is currently being expanded with the introduction of a double metro line which will be the longest in continental Europe: L9/L10. Nearly all existing lines are also growing, some extensively like L2, and as of 2014 they are undergoing reforms. Trambesòs carriage by Glòries and the Torre Agbar. Although Barcelona had an extensive tram network (operated by Tramways de Barcelona S.A., a distant antecessor of Transports Metropolitans de Barcelona) during the 20th century, and was highly dependent on trams, as the 1951 tram boycott proves, the tram network was upgraded in the early 1960s with the acquisition of a total of 101 PCC type tram cars from the DC Transit system of Washington, DC. Tram service was eventually discontinued in 1971, except for the Tramvia Blau on the Tibidabo. In 2004, however, two new tram systems were introduced: Trambaix (taking its name from the Baix Llobregat comarca, the western part of the metropolitan area), and the Trambesòs, from the river Besòs which runs through the eastern part). Both systems have three routes each (as of 2009), but new introductions are expected and pending of approval. An ambitious project to link the whole of Barcelona through Avinguda Diagonal and linking both systems is pending revision. Buses in Barcelona are a major form of public transport in Barcelona, with an extensive local and interurban bus network. There is also a network of night buses called Nitbus and it is being set up a bus rapid transit system called RetBus, which is intended to complement the current local bus network. All bus routes serving Barcelona metropolitan area are organized by Autoritat del Transport Metropolità (ATM). Local services are operated in most part by Transports Metropolitans de Barcelona (TMB), although other bus services are operated by several private companies under common names. The Funicular de Montjuïc, climbing up Montjuïc hill, is fare-integrated with the Barcelona Metro network. Funicular de Vallvidrera, in Vallvidrera, is part of Ferrocarrils de la Generalitat de Catalunya. A third funicular, on Tibidabo hill, Funicular del Tibidabo, is operated by TMB and allows access to the Tibidabo theme park. The city has two aerial cable cars: Montjuïc Aerial Tramway (to the Montjuïc castle) and Port Vell Aerial Tramway that runs via Torre Jaume I and Torre Sant Sebastià over the port. Also, in the metropolitan area of Barcelona work Aeri de Montserrat and Teleférico Olesa-Esparraguera (es). Barcelona is served by Barcelona Airport situated in the suburbs, about 17 km (11 mi) from the centre of Barcelona. It is the second-largest airport in Spain, and the largest on the Mediterranean coast. It is a main hub for Vueling Airlines and Clickair, and also a focus for Spanair, Air Europa and Iberia. The airport mainly serves domestic and European destinations, but some airlines offer destinations in Asia and the United States. The airport is connected to the city centre by highway, commuter train and scheduled bus service. The airport handled 35,145,176 passengers in 2012. A new terminal (T1) has been built, and entered service on 17 June 2009. Sabadell Airport is a smaller airport situated in the suburbs, devoted to pilot training, aerotaxi and private flights. Some low-cost airlines, such as Transavia.com and Ryanair, prefer to use Girona-Costa Brava Airport, situated about 90 km (56 mi) to the north of Barcelona, the Reus Airport situated 77 km (48 mi) to the south, though they offer some flights from Barcelona-El Prat Airport and also Lleida-Alguaire Airport situated about 150 km (93 mi) to the west of the city. The city airport system, measured by passenger traffic, is one of busiest city airport systems in Europe, having nearly 40 million passengers per year. ↑ van Marle, Gavin (31 January 2008). "Europe terminals stretched to limit". Lloyd's List Daily Commercial News. Informa Australia. pp. 8–9.